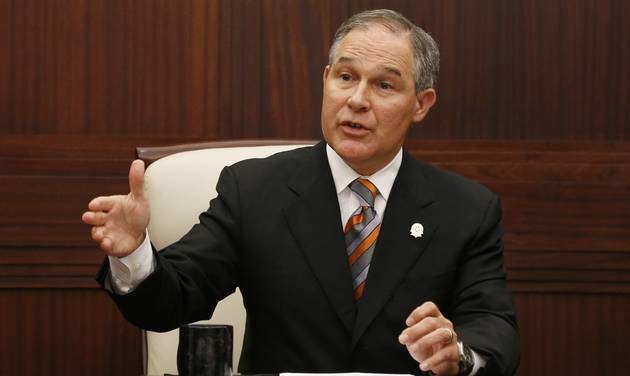 Oklahoma Attorney General Scott Pruitt has sued the Environmental Protection Agency more than a dozen times to block air, water and climate protections. Nominating Oklahoma Attorney General Scott Pruitt to run the Environmental Protection Agency gives lie to Donald Trump's claim that he is serious about protecting the public from pollution. While the president-elect has waffled on climate change, he has been unequivocal about toxics. "Clean air is vitally important," Trump declared during a Nov. 22 interview with The New York Times. "Clean water," he added, "crystal clean water is vitally important. Safety is vitally important." And when he announced Pruitt's nomination in early December, Trump vowed that the attorney general would "restore the EPA's essential mission of keeping our air and water clean and safe." Putting aside the fact that the EPA has not forsaken that mission, Pruitt's track record indicates that he would do the exact opposite. Under Pruitt, the acronym EPA would stand for Every Polluter's Ally. Since he took office as Oklahoma's attorney general in 2010, Pruitt has repeatedly sued the EPA to block key safeguards limiting power plant pollution, most notably the Cross-State Air Pollution Rule, which limits sulfur dioxide and nitrogen oxides, and the Mercury and Air Toxics Standards (MATS), which curb mercury, arsenic, cyanide and other emissions. Sulfur dioxide and nitrogen oxides are primary ingredients of soot and smog pollution, which cause a number of respiratory problems, including bronchitis and aggravated asthma, as well as cardiovascular disease and premature death. Some 25 million Americans suffer from asthma, alone. That's one out of every 12 people. Mercury and other toxic pollutants covered by MATS have also been linked to heart disease, neurological damage and birth defects. The potential benefits of the Cross-State Rule and MATS are considerable. Taken together, they are projected to prevent 18,000 to 46,000 premature deaths across the country and save $150 billion to $380 billion in health care costs annually. In Pruitt's home state, the two regulations would avert as many as 720 premature deaths and save as much as $5.9 billion per year. Pruitt also has sued the EPA to prevent the agency from implementing a rule that would reduce the amount of ground-level ozone, or smog, which the American Lung Association says is the most widespread pollutant nationwide and one of the most dangerous. Produced when sunlight heats nitrogen oxides, volatile organic compounds and carbon monoxide from power plants, industrial facilities and automobiles, ozone pollution has been linked to respiratory problems, cardiovascular disease and premature death. It is particularly harmful for the most vulnerable, including children, the elderly and people already suffering from asthma or another respiratory disease. Pruitt has also targeted clean water safeguards. In July 2015, he sued the EPA over the Clean Water Rule, which the agency and the Army Corps of Engineers had just issued to clarify the scope of the Clean Water Act. The rule was in response to two Supreme Court decisions -- in 2001 and in 2006 -- that called into question whether the federal government had the authority to protect smaller streams, wetlands and other bodies of water that flow into drinking water supplies. From a scientific perspective, it's a no-brainer. As EPA Administrator Gina McCarthy explained in a statement: "For the lakes and rivers we love to be clean, the streams and wetlands that feed them have to be clean, too." Pruitt doesn't see it that way. In a March 2015 column he co-wrote with Kentucky Sen. Rand Paul for The Hill, Pruitt called the Clean Water Rule "the greatest blow to private property rights the modern era has seen." Pruitt and Rand maintain that states should be responsible for protecting the environment within their respective borders, not the federal government. Never mind that air and water pollution do not honor political boundaries and state legislatures are all too often dominated by corporate interests. Besides Pruitt's disdain for air and water safeguards, he is no fan of federal efforts to address climate change, which he falsely insists is an open scientific question. Pruitt, who has received generous contributions from fossil fuel interests, is not only party to a pending lawsuit against the EPA over its Clean Power Plan to curb electricity sector carbon emissions, he also attempted unsuccessfully to overturn the agency's science-based "endangerment finding" that greenhouse gases threaten public health and welfare, a cornerstone of the EPA's climate work. "The EPA plays an absolutely vital role in enforcing long-standing policies that protect the health and safety of Americans, based on the best available science," Kimmell said in a press statement. "Pruitt has a clear record of hostility to the EPA's mission, and he is a completely inappropriate choice to lead it. ... It's this simple: If senators take seriously their job of protecting the public, they must vote no on Pruitt."